Tanker Pennsylvania Sun burns after a single torpedo from U-571 struck amidships on the port side at 0729 Hours on July 15, 1942. The torpedo's explosion tore away the port flying bridge. The Quartermaster, Able Seaman John C. Riley of Marcus Hook, Pennsylvania, and Ordinary Seaman Richard W. Sumerall were both killed. 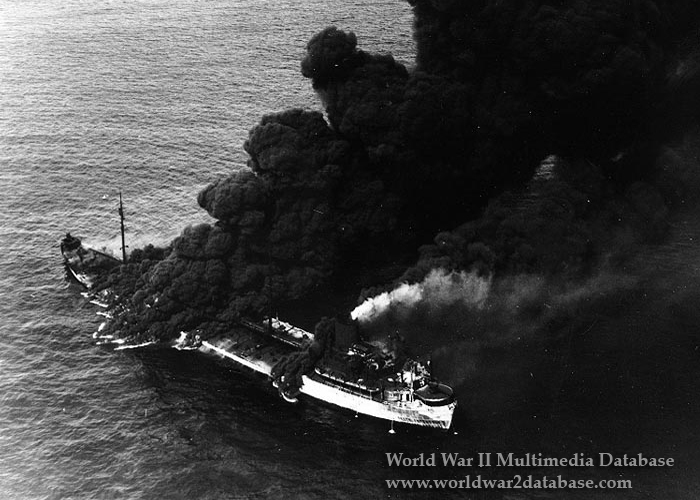 Their bodies were found cremated, so the exact cause of death was not determined; they either were killed in the initial explosion or in the conflagration when the cargo, 107,000 barrels of Navy grade bunker oil, caught fire. Several other crew and Armed Guard were injured. The rest of the crew abandoned ship and spent three hours in the water until USS Dahlgren (DD-187) rescued them without further fatality. After a patrol aircraft reported that the ship was still afloat and the fires abated, Captain Frederick Lyall, Chief Mate Howard W. Quigley, Chief Engineer Harry J. Moorhead, and First Assistant Engineer Woodrow Wilson re-boarded the ship with the help of the crew of USS Willet (ARS-12) a salvage ship operated for the United States Navy by the civilian firm of Merritt, Chapman, and Scott. Willet's crew and Pennsylvania Sun's officers put out the fire and saved the ship. She returned to service in 1943. U-571, a type VIIC U-Boat on her seventh war patrol, was commanded at the time by Kapitanleutnant (later Korvettenkapitan) Helmut Mohlmann (June 25, 1913 - April 12, 1977) who had already sunk the British freighter Umtata, the American tanker J.A. Moffett, Jr. and Honduran-flgged Steamship Nicholas Cuneo, owned by United Fruit. U-571 sank one ship each day from July 7-9, 1942 before damaging the Pennsylvania Sun on July 15. After her 59 day patrol, she returned to the U-Boat pens at La Pallice, France. Mohlmann was later sent to Norway to command U-Boats there. U-571 was sunk on January 28, 1944, west of Ireland, on her eleventh war patrol. Her Captain, Oberleutnant zur See Gustov Lussow, and her entire crew of fifty-one men were lost.